This image was made in my studio with a Leica M6 camera and a Leica 135mm f3.4 Apo lens on Ilford Black & White film. 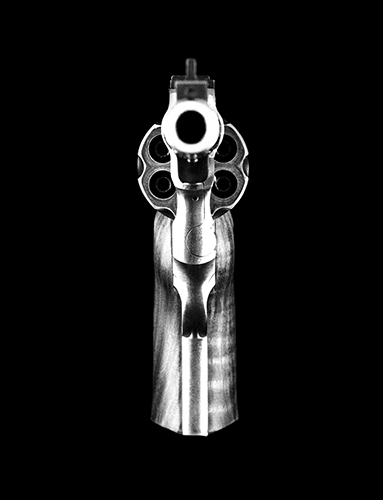 The photograph shows a loaded .44 Magnum Ruger Redhawk revolver lined up directly at the viewer. Since a Leica M6 camera is a range finder rather than a single lens reflex camera, what the photographer sees in the view finder is not exactly what the lens records and that difference is magnified as the subject of the photograph gets closer to the front of the lens. Getting the Redhawk to line up right into the lens was a tedious process. The gun was suspended at the end of a 4 foot piece of copper tubing which was invisible because the tubing was directly behind the gun coming through a piece of black velvet. Once the camera on a tripod and gun were basically in position and lit, I moved the camera, then sighted over the gun barrel and kept moving the camera and sighting again until I could see the front of the barrel of the gun reflected exactly in the center of the filter on the lens. That told me what the lens was “seeing” which was different from what I saw looking through the view finder of the camera and the image was ready to be made. From start to finish, the making of this image took about eight hours and was made the “old fashioned” way, many years before Photoshop.